Part of Ian Kiaer’s installation Endless House Project: Ulchiro Endnote / Pink (2008) consists of a paper and matchstick construction small enough to fit in the palm of your hand. It resembles a building of some kind; if not a conventional house then perhaps a shop or a commercial premises, with an upper level that juts out over the ground. Most of its walls are created from rectangular images, each one a cell cut from a Manga comic strip, each one joined to its neighbour by way of scarified globs and hairy tendrils of glue, dispensed, it appears, via a hot-melt glue gun. Kiaer’s is an art of entropy and disintegration. Formally and philosophically, he tests the propensity of things to hold together, to prise apart or to float irredeemably away from one another. The conclusion he arrives at, more often than not, is the latter. In the case of the house in Endless House Project: Ulchiro Endnote / Pink the glue seems hastily and inconsistently applied. The object remains, however, a cohesive nucleus compared to the constellation of objects beside it. On the floor: a creased quadrilateral of black polythene, over which the tiny building peers as if it were a lake, and another crumpled sheet of translucent polythene, tinted pink. On the wall: a large rectangle of pale pink taffeta, pinned to a wooden stretcher, and another, smaller stretcher bearing the same fabric, adorned with a vertical line of black ink spots. The installation adds up to a series of substitutions, of nods to absent or impossible things. The paper building, for instance, is little more than an idea of a building, a probably unrealizable structure (the wide upper storey makes it precariously top-heavy), animated by disconnected frames of cartoon narrative. While the polythene might gesture to water or a landscape, it might also be discarded rubbish. Although it seems natural to call the rectangles fixed to the wall ‘paintings’, can the term be applied in any meaningful sense? Materially, they are as much paintings as any Modernist monochrome, but in their flimsiness they seem void of all content and conviction, although the ink blots on the smaller work leave the door slightly ajar for content to gust back in. They refer sotto voce to a graphic convention occasionally used in Manga comics whereby characters dissolve into lens flares in the closing frame of the story. Their content – such as it is – is the very departure of content itself. A recent body of work circles the elusive tulipa nigra, the eponymous flower from Alexandre Dumas’ 1850 novel The Black Tulip. In the book, the unnaturally bred flower is held as symbol of enlightened perfection, relentlessly pursued by the protagonist even despite his incarceration. Kiaer, similarly, is at once confounded and irresistibly attracted by things he believes to be impossible for the artist today. Trained as a painter, he is consumed by what he calls ‘the endless death of painting’. How, then, does he manage to haul himself out of bed each morning and make work about a ship that has sailed? He makes models. Those pink rectangles fixed to the wall are models of paintings, in the same way that the gluey paper box is a model of a building. An exhibition that Kiaer is preparing for the Kunstverein Munich, opening on 10 June, consists, at the time of writing, predominantly of such wall-based works, though they will remain, perhaps indefinably, models of paintings. The status of the model, Kiaer says, is always one of movement: it travels between an idea and the concretization of that idea, whether it has already taken place or is yet to come. It is physically light, transportable and schematic. It need not be finely crafted – in fact, speed is often a prerequisite of its construction. In some instances the model is impossibly optimistic, presenting an idealized image with all imperfections smoothed out. It is always critical in its relation to the thing it represents. For many of the artists and architects who Kiaer is interested in, the model is not a means to an end but an end in itself – the articulation of an idea perpetually preserved in the womb of the imagination, never tested by being born into reality. Frederick Kiesler, a Romanian architect who settled in New York in 1926, spent much of his life evolving plans for what he called his ‘Endless House’. The modular structure would be a new kind of home, rejecting the box-like forms of conventional buildings in favour of curving walls that allowed no dark corners or sharp edges. Responding directly to the human body, the ‘Endless House’ embodied the architect’s theory of ‘Correalism’ – the idea that, in Kiesler’s words, ‘an object doesn’t live until it correlates’, and that the space between forms is as real as the objects themselves.2 It is easy to see the influence of Kiesler’s theory on Kiaer’s airy arrangements, and even on the artist’s frequent employment of (slightly deflated) inflatables in his work. 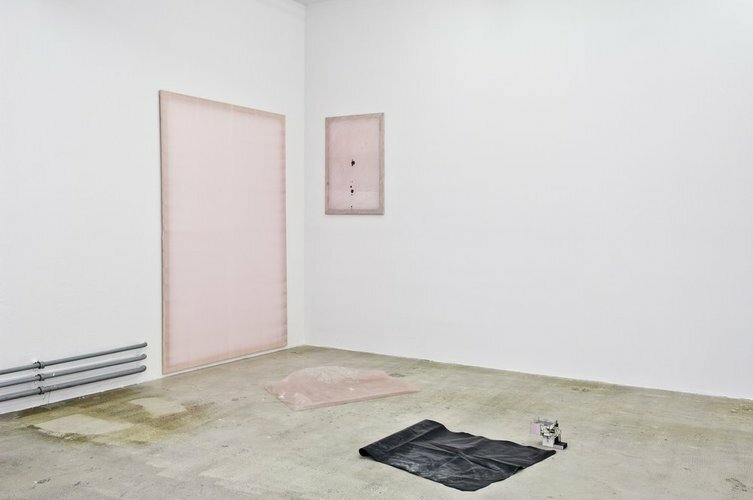 Just as the model building in Endless House Project: Ulchiro Endnote / Pink transforms a sheet of black plastic into a lake merely through its physical proximity, so fictions are fanned into flame by the conjunction of hitherto inert objects. What is most important for Kiaer about Kiesler’s project, and the reason that he has named an ongoing body of work after the ‘Endless House’, is that it reveals something vital about the relationship between an individual and his or her environment, and about the ebb and flow between interiority and open space. This relationship is felt all the more acutely by a studio-based artist such as Kiaer, who typically works alone while attempting to make meaningful connections with life outside. In his essay ‘Building Dwelling Thinking’ (1954), Martin Heidegger traces the etymology of the world building (Bauen, in German) to the Old English and High German Baun, meaning to dwell, and thence to the verb to be : ich bin, du bist and so on.3 Built dwellings, says Heidegger, reflect our very being in the world. With this in mind, Kiaer has often returned to the early history of glass architecture, in particular the proposals made in the early 20th century by the German architect Bruno Taut, and their excited endorsement by Taut’s contemporary, the novelist, poet and artist Paul Scheerbart. Taut envisaged glass architecture transforming not just the appearance of the contemporary city, but actually bringing about new social harmony. In Taut’s temporary glass pavilion for the 1914 Werkbund Exhibition in Cologne, Scheerbart contributed 14 slogans to the interior of the brightly coloured, prismatic dome, including ‘coloured glass destroys hatred’, and ‘without a glass palace life is a burden’. Heedless of Scheerbart’s warning, months later Europe was at war. For Grey Cloth Project: Glashaus (2005) Kiaer remade Taut’s pavilion in miniature with card and jaundiced yellow plastic, the structure’s incomplete dome rising beseechingly towards its idealized plan view painted in watercolour on the wall above it. Elsewhere in that body of work, as in the installations Grey Cloth Project: Scheerbart / Bed and Grey Cloth Project: Scheerbart / Projector (both 2005), Scheerbart’s illness and eventual death in 1915 are acknowledged by Kiaer through the inclusion of rudimentary life-sized beds. It is attractive to the artist to imagine Scheerbart vicariously inhabiting these transparent structures filled with light and colour while confined to his sickbed. A more recent work, Kortrijk Proposal (2009), carries this image of incapacitation further still through reference to Thomas Mann’s 1921 novel The Magic Mountain. In the book, the bourgeois patients of a Davos sanitorium survey a disintegrating Europe on the brink of World War i from their reclining chairs, ‘piously withdrawn, looking down from a height of 5,000 feet or so upon the earth and all that therein was’.4 Kiaer’s response, a full-sized cardboard model of a distorted reclining chair, will be produced for public use in a new hospital in the Belgian city of Kortrijk, alongside a high window with panoramic views over the typically flat landscape below. Beside it stands a small structure not unlike a cross between Taut’s pavilion and a bedside table, which also refers both to the geometric form in Albrecht Dürer’s engraving Melencolia I (1514) known as Dürer’s Solid – a mysterious allegorical object of intellectual contemplation – and a rejected proposal from 1924 by the avant-garde Russian architect Konstantin Melnikov for Lenin’s sarcophagus. Indeed, the fragmentary, incomprehensive and reticent nature of Kiaer’s visual language forms the meat and potatoes of his practice. This is part of the work’s sickness, but it is also what gives it life. It is pervaded by an ever-present promise of something withheld, of something mysterious, vast and wonderful yet now obscured or forgotten. Kiaer is fascinated by the potential of a fragment to stand in for the whole, and by the contemporary impossibility of representing that same whole from an all-encompassing, universalized overview. It is for this reason that he remains entranced by the paintings of Bruegel, whose training as a cartographer enabled him to picture the world as a receding stage populated by concurrent, mutually oblivious events while somehow managing to cling together as a unified field of vision. Kiaer first paid tribute to the painter in an early, important work titled Bruegel Project: Casa Malaparte (1999), in which he isolated and repainted the windmill perched precariously on a spike of rock in Bruegel’s The Procession to Calvary (1564). He did not consider the quotation a painting so much as a model; similarly, in the same work a stool, a lump of foam and a tiny card box stood as a model for another building on a rock, the villa built by the writer Curzio Malaparte in 1942 on the island of Capri. Both the windmill and Casa Malaparte allow their occupants to gaze upon the world from a solitary position of removal; with distance, it is hoped, comes enlightenment. Standing over Kiaer’s dismembered and silent installations, it is hard not to be skeptical of that possibility. Instead, the artist clears a space distinguished not by the authority of its privileged vision, but by its openness to the potential of discovery through making, to what is often termed poiesis. In contrast to its classical partner, praxis, which is understood as the direct articulation of the artist’s will, poeisis refers to an exploratory process of making which results in the unveiling of meaning. Theodor Adorno defended the form of the essay over that of the thesis along equivalent lines: ‘Instead of achieving something scientifically, or creating something artistically, the effort of the essay reflects a childlike freedom that catches fire, without scruple, on what others have already done.’6 This is the mode of creativity that Kiaer subscribes to. By shuffling together existing fragments and by paying close attention to the combustible spaces between them, Kiaer, despite his preoccupation with past failures, frustrated ambitions and exhausted narratives, has his hopeful gaze set firmly on that which remains possible. He is not parading empty vessels, but refilling them one drip at a time.